*** NEW *** Short sleeve, double-sided print, army green T-shirt with distressed "Guinness 1759 Dublin, Ireland Trademark" logo on front and Guinness logo on back. Made of 100% cotton. 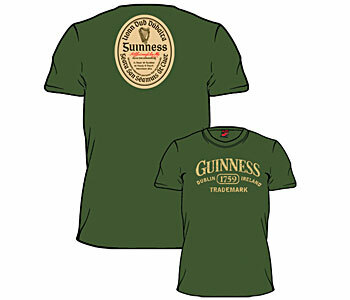 All Guinness merchandise is officially licenced. Available in medium to x-large (XL). Click to review this product.